Are unknown treasures buried within your old coins? NEWPORT BEACH (27 January 2010) — Coming upon money is always financially rewarding. However, inherited coins could unknowingly be more than their face value. With the direction of numismatic expert Jeff Ambio, non-coin collectors can prevent making the heartbreaking mistake of spending a coin potentially worth over a hundred times its face value in a parking meter or to pay for groceries. 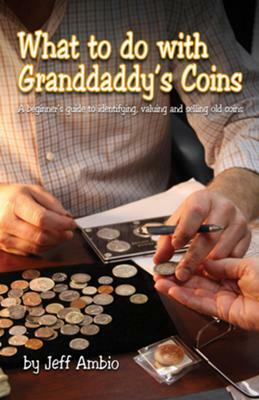 What to do with Granddaddy’s Coins provides an easy guide to understanding how to assess a coin’s value and how to obtain a maximum profit. Jeff Ambio prepares the reader to confidently approach the numismatic community, dealers and auction houses with knowledge about their valuable coins. Step-by-step directions will prepare readers to identify and approximately value their coins, saving time and distress when approaching an expert. All the basics of managing rare coins are covered in this complete guide. Unlike any other book on the market, this guide is designed for anyone who came into a coin collection who is looking for profit. What to do with Granddaddy’s Coins is an indispensible tool for the non-coin collector seeking to gain optimal benefits from their inherited coins.